Ensure you are complaint with the law with our range of licensing bar notices. It’s the law to ensure that you are complaint with your local council so make sure you ahve the correct pub law signs and legal notices. Not everything in this section is mandatory and your councils will state what you need to display. Our range of licensing bar notices will help you comply with legistlation as we stock signs like 'please leave the premises quietly', 'no drugs' etc. 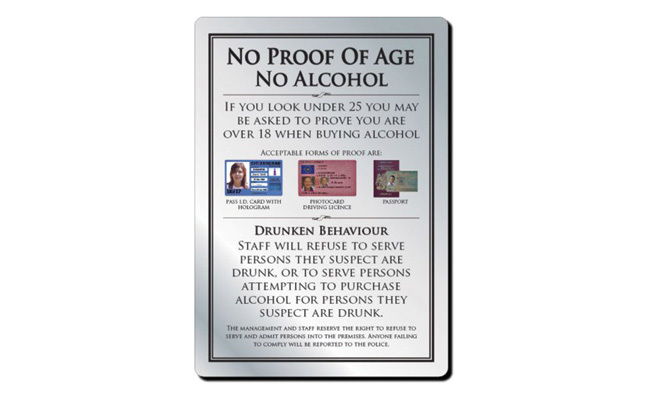 This range of bar signs also include car parking disclaimers, proof of age signs as well as weights and measures act notices. Buy Your Licensing Bar Notices & Make Sure You Are Legal! Find all the licensing bar notices you need for your bar or pub at Pattersons Bar Supplies. This range of pub law signs and legal notices form part of a range of bar signs, bar equipment and bar supplies you need to be compliant with your local councils.We also stock a large array of catering safety signs if you’re looking for signs and notices for your back of house too. If you have any questions about the range of licensing bar notices we supply at Pattersons Bar Supplies, do not hesitate to contact our team of wholesale bar product experts on 0117 934 1270.